Noche Flamenca’s summer intensive dance program in New York City is designed to provide a global approach to dance training. Classes in Dancer Preparation & Conditioning, Hip-Hop, Modern Dance, Flamenco, and Composition and Choreography will provide a 'big-picture' understanding of the world of professional dance. Incorporating holistic interdisciplinary dance training, students will learn how to associate movement with an awareness of the body’s potential for expression. The goal is for an aspiring dancer to understand the fundamentals of various dance forms and how these elements can be utilized to push beyond the limitations of their current personal practice. Noche Flamenca Artistic Director, Martin Santangelo’s objective is to provide the absolute best training in the most economic manner, making dance education accessible to everyone. This is an extraordinary opportunity for dancers to receive training and education taught by artists of the highest caliber. 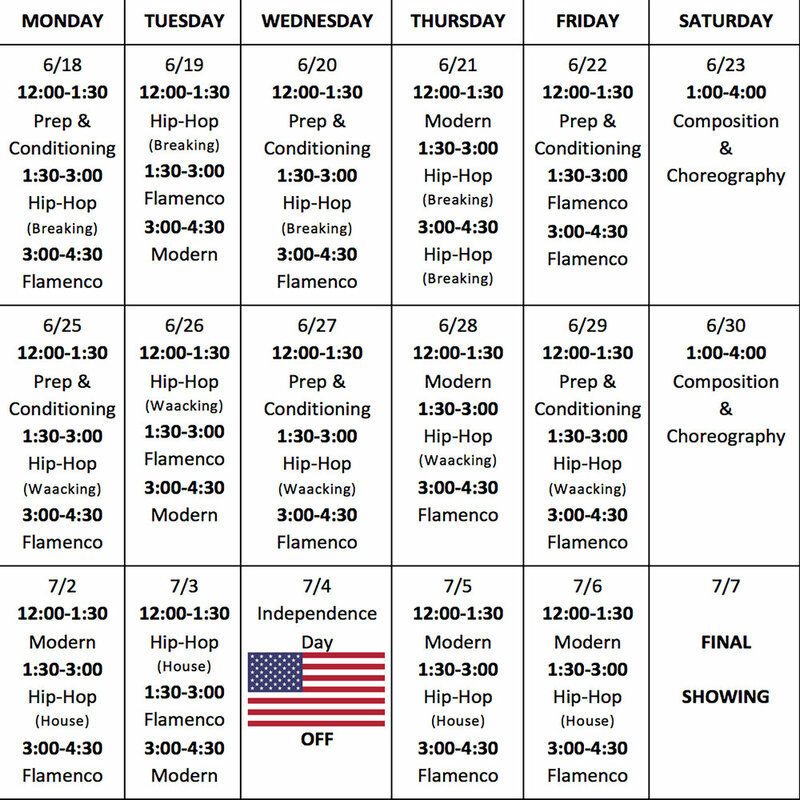 Tuition includes classes, Mon-Sat, for 3 weeks beginning June 18th (schedule below) and a culminating performance on July 7th at The Theater at West Park, open to family and friends. •Studio practice space available (by appointment). This class is an essential preparation for professional dancers of any discipline. It includes strengthening, flexibility, alignment, and conditioning - all necessary tools to develop a consciousness and profound understanding of the body. This approach is critical for any dancer to be able to create their own unique and individualized daily practice adapted to the needs of their own body. Knowing your body helps to avoid injury and prolong your professional life as a dancer. This class requires participants to bring their own water bottle and mat. Socks required. This class focuses on the Andalusian art form that was born of great pain, joy, and a myriad of extreme circumstances. These life experiences required people to find catharsis through dance, song, and music. Flamenco technique, choreography, and culture will be taught. 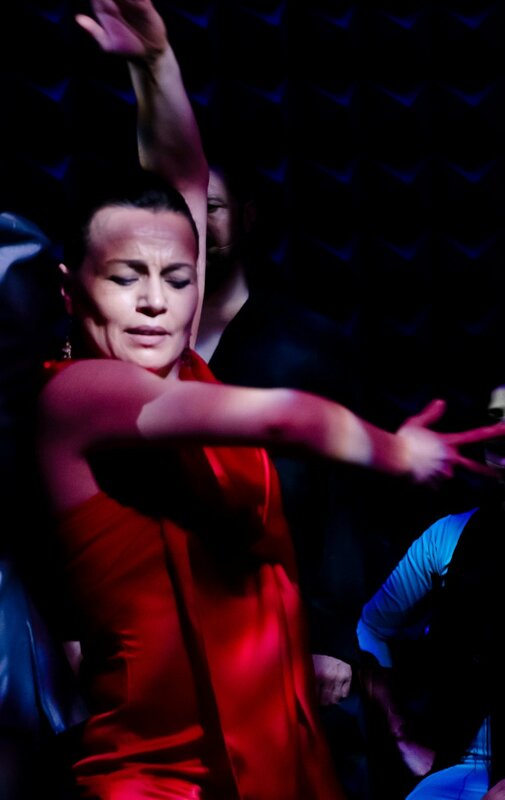 Unlike other dance disciplines, flamenco does not require a certain body type. Like hip-hop, one can put their own personality and improvisational style into the dance rather than fitting into a certain mold. Both disciplines connect strongly with the earth and an ancestral culture and share complimentary foot work. Flamenco shoes will be provided by Noche Flamenca. Breaking (wk1): This class will focus on the foundational elements of this highly physical dance. From 'top rocks' to 'go-downs', 'footwork' and 'freezes', students will learn the importance of practice, ciphering, and battling. Waacking (wk2): This class will explore the dances linked to the Disco and House eras. It is based on physically engaging the dance while experiencing one’s core essence. Rooted in music and activating each part of the body, it allows freestyle (improvisation) to happen naturally. House- “Like a Nubian” (wk3): This class will focus on club-style dance, bringing awareness of moves to the music. 'Footwork', 'legwork', and 'floorwork are just a few elements we will work on. All hip-hop classes require participants to bring their own sneakers. Jeanette will provide students with a creative dance experience that includes classical modern dance technique and improvisation that explores the dance elements necessary to develop performance skills. This class requires participants to be barefoot. This class explores and examines the theory and practical applications of composition & choreography. It will allow students to understand perspective, reveal how movement manifests within space, and how to use compositional guidelines to express specific ideas. Through music and vocal (song) structure, students will learn the rules of composition and will choreograph short pieces based on what they have learned in the other classes, to be discussed, analyzed, and then performed at the conclusion of the workshop.